You may remember when we first started talking about the VeriChip, a miniature RFID microchip manufactured then by Applied Digital Solutions. This RFID product was cleared for implantation in humans by the American Food and Drug Administration. The company stated at the time that the recommended location for implanting their product was 'in the triceps area between the elbow and the shoulder of the right arm' – a direct quotation from their website which has since gone offline. But from reading various secular articles on the internet, it became clear that many people were actually injecting these chips in their hands. I even came across this article, first published in 2005 following the Asian Tsunami, which stated that the VeriChip was usually implanted in the 'right hand or forehead'. Very ominous indeed. Applied Digital Solutions had a very difficult time marketing their device (not surprising given its connotations to the 'Mark of the Beast' system mentioned in Revelation), and the technology has since been sold and rebranded several times (XMark). It has also branched off into a number of different applications, including VeriMed for providing medical information to doctors in emergency situations, VeriGuard for keeping track of alzheimer patients, VeriPay for contactless payment, VeriTrace for tracking dead bodies following natural disasters, and VeriKid for supposedly finding abducted children. So as you can see, the idea of using RFID technology for personal identification purposes, in one form or another, seems to be here to stay. Quote: “As you can tell from the above picture, the NFC device Seth used is only a few millimetres in size, and they are getting smaller all the time. 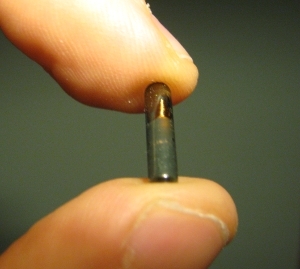 That’s tiny enough to be embedded in a watch or ring. So why implant it? The simple answer is that once something is inside you, it’s a lot harder for anyone to take it away from you. It not only becomes part of you in a way no piece of jewellery can, but it also becomes part of our society at large. In other words, no one then gets the right to force you to remove it. Quote: “Sjöblad is also convinced that beyond these first applications, the "connected body" has a great future ahead. "We carry with us loads of personal objects — bank cards, driving licences, library cards, house keys, office keys, car keys, which have no other goal than to identify us. Eventually, we'll be able to get rid of all that and to replace them all with one unique digital identification." One unique digital identification. How handy... Now I am not a conspiracy theorist, and I don't believe this is the Mark of the Beast yet, but it does seem that the assumption is constantly being made that better tracking and identification of individuals can only benefit society. That of course depends on who is in government. If Hitler were in power today I certainly would not want him being able to track my every move. So as you can see, the same technology that is used for the benefit of society can also be used to harm it. The book of Revelation foretells of a time when a global identification system will be ushered in. The Bible doesn't mention a specific event that causes this to happen, but it does say that a man whom the Bible identifies as the 'false prophet' will compel all people to receive an identifying mark in their right hand or forehead. And without this identifying mark, nobody will be able to buy or sell (Revelation 13:16-18). Now I don't believe that this VeriChip is the 'Mark of the Beast'. Firstly, the Bible states that it will be the false prophet who will be the one to introduce it to the world. Secondly, the book of Revelation directly links taking the mark with worship of the Antichrist, so it is more than just a monetary system that is being accepted. And thirdly, no true believer in Jesus Christ can ever unwittingly receive the Mark of the Beast. If your name is written in the Lamb's book of life, it's not possible for you to worship the image of the Beast or receive his mark (Revelation 13:8). But I do believe that the technology is now here to fulfil these verses, and it does bear a striking resemblance to what is recorded for us in the book of Revelation. What does all of this mean? Jesus Christ is coming back soon. The question is, are you ready to meet Him? God loves you so much He sent His only Son Jesus Christ into the world to be your Saviour (John 3:16). Jesus Christ bore God's punishment for your sin when He died upon the cross (Isaiah 53:6). And all who accept Him as Lord and Saviour, their sins are forgiven, and they shall enjoy eternal life with Him in heaven (Acts 13:38-39). Why don't you turn away from your sins, and put your trust in the Lord Jesus Christ for salvation today.